BoatsToGo - Blog About Inflatable Boats, Inflatable Rafts, Inflatable Kayaks And More... :: I Can Finally Afford to be a Boater with my New Inflatable KaBoat! HomeBoatsToGo - Blog About Inflatable Boats, Inflatable Rafts, Inflatable Kayaks And More...I Can Finally Afford to be a Boater with my New Inflatable KaBoat! I Can Finally Afford to be a Boater with my New Inflatable KaBoat! Up until a few months ago, I had never even heard the word KaBoat. See, I was always a fan of boating, but could never really afford to spend the money to truly get into the hobby. Between the cost of the boat, the insanely high fees to dock one, cleaning costs, maintenance costs, and more, I just always figured that boating would have to remain a special treat in my life. That is, until a neighbor of mine invited me out for a day on the water. We met up out front of his house on a Sunday morning, jumped in his car, and headed out. The whole time I figured we were driving over to wherever he had his boat docked, and I was excited to see the boat he described as “the perfect 18 foot watercraft.” But when we got to the lake, I was completely confused. There was no dock in sight. No boathouse around. Just nothing. That’s when he popped his trunk and pulled out a small outboard motor. He saw the look of confusion on my face and just smiled as he opened the back door of the car and pulled out what looked like a piece of luggage. Out of that luggage came something I had never seen before. It was his Saturn SK487XL Inflatable KaBoat from BoatsToGo, and it would eventually allow for me to take up boating as a full-time hobby. I had heard of inflatable boats before, but for some reason I had always just pictured little dinghies and emergency rafts for larger ships. Boy, was I wrong. 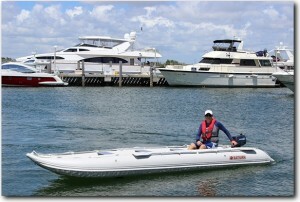 See, the KaBoat is a hybrid of a regular inflatable boat and inflatable kayak. It has plenty of space for you, your friends, and a bunch of fishing fear. But its slim-hulled design allows it cut easily through the water. This results in a boat that performs very highly on just a small outboard motor, kayak paddles, or rowing oars. It can even be rigged for sailing! The boat was quickly and easily inflated, and as we started out onto the water I honestly couldn’t believe what I was experiencing. I asked question after question, which my neighbor happily answered, each time with a grin. I had already seen how portable the boat was, so my next question was about durability. He told me that the inflatable boats from BoatsToGo are all made with a heavy-duty PVC fabric that makes them resistant to abrasions and punctures. He said he never had any of these problems, but had asked the same questions before buying his 16’ KaBoat. When he did research, he found out that not only are punctures extremely rare, but that these inflatable boats are designed with 4 separate air chambers for extra safety. He told me about how it came with 4 aluminum benches, but that he easily and cheaply replaced them with the much more comfortable chairs we were currently sitting on. Needless to say, we had a great day out on the water. But I wasn’t sad to see it end, because I was itching to get home and take a look at all the inflatable boats on BoatsToGo. The first thing that hit me was how low the prices on these inflatable boats were. It was right then that I knew I could make my boater dream a reality. I looked around for a while, and decided that I just liked the KaBoats too much to try anything different. They came in multiple sizes, but I couldn’t help but choose the same 16’ SK487XL that my neighbor had. For $999, how could I really go wrong!